My mother-in-law, Judy, came down to visit a couple of weeks back and she volunteered to watch the girls so I could paint. Well, she didn't have to offer twice. I took the opportunity to paint Paul's office, which had become our dumping ground for everything we couldn't find a home for. It was a mess. Judy helped me sugar soap the walls and scrub the windows clean while S was sleeping, and then I got cracking with the rest. This is the first room I've done completely by myself and I'm feeling great that I was able to do it. It's so satisfying developing new skills. The room was dark blue before, the same as the girls' bedroom before it was transformed. The following photo doesn't show you the colour properly - it makes it look much more royal than the navy it actually was, but at least you'll have an idea of how dark the room was. BEFORE: Getting ready to paint over the dark blue walls. Now the following photo is going to be a bit controversial, I know. People were not excited when we told them we were going to paint a green feature wall in Paul's office. I wasn't that excited about painting it, truth be told. All the extra cutting in and faffing around with washing more brushes and rollers. BUT, now that it's here I actually kind of love it. There are two big sets of windows in Paul's office which let in views of (admittedly messy) greenery. The green wall amplifies that green and makes the office feel very restful, like it's in a trampers hut somewhere in the middle of the bush. AFTER: One Resene Zomp (green) feature wall and three Resene Geyser (gray) walls. AFTER: Paul's desk back in place in front of Resene Geyser (gray walls). AFTER: Rugged-up Paul working in his new office. Even though this room has a green feature wall, you don't see it from the rest of the house. Looking from the kitchen into Paul's office, the colour you see is the Resene Geyser (gray), which helps give a more seamless look and makes the house look bigger. Looking into Paul's office from the kitchen. In this next photo, you can see the large bookshelf that used to live to the side of our dining room. Moving it out of there has opened up that space and made it feel bigger and lighter. Moving it in here makes use of the dead space behind Paul's door and helps this room feel more like a home study, which I like. 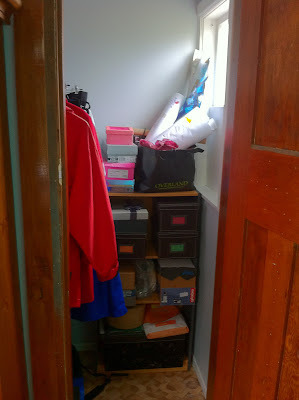 AFTER: From left, door into office, bookshelf, wardrobe/craft cupboard. It used to be sooo gross inside the office wardrobe. Musty, lumpy walls and chipping paint on the window meant I didn't want to spend any time in the wardrobe organising it properly. AFTER: Office wardrobe where we store winter coats and craft supplies. Since it's just a cupboard I didn't bother plastering the walls, but I did give them a good scrub and sand down whatever bumps I could. Painting this little room added a lot of time to the office makeover, but I was glad to do it because I'm so much happier using this space now. So what do you think of Paul's new office? I must like it. I'm sitting in here typing this post - something I never would have done before. Love, love that feature wall color! It rocks! You've been a very busy bee! Yay! Thanks Gwen. I'm glad someone outside our family likes it! Hi! We've recently launched the site www.Recipesup.com, on our website you can promote your blog and win prizes. I invite you to go and take a look. Your blog will be in the top rank of Recipesup blogs. Hopefully your food blog will be up there in the top! Awesome to see it all finished Well done Emma!! Couldn't have done it without you Judy! Thanks heaps. The girls had a blast with you and Sophie still asks for "Nanny?"